Lake Tahoe is renowned around the world for its spectacular scenic splendor, but ever since a crude rock and log splash dam was constructed several miles below its outlet to boost river flow and facilitate log fluming, entrepreneurs have coveted the lake’s famously pristine waters. While the most outlandish schemes to appropriate Tahoe’s water were ultimately unsuccessful, today the magnificent alpine lake is primarily operated as a reservoir for irrigation storage and municipal water use in Nevada. Together with a handful of other public and privately owned reservoirs in the Truckee River system, Lake Tahoe provides about 75 percent of the water supply for the Reno-Sparks area. All drinking water of Lake Tahoe is pumped from underground aquifers through an intricate system of wells and water booster stations interspersed through the service area. To ensure that adequate amounts of water are delivered safely to homes and businesses, the system also maintains 23 tanks and 26 pressure-reducing underground valves. The District provides water to over 13,000 homes and over 625 commercial and governmental sites, supplying more than 2.5 billion gallons of water annually. 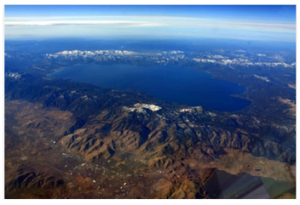 But now, a new study shows how Lake Tahoe might serve as a mammoth reservoir that could significantly mitigate California’s chronic water shortages without tarnishing the lake’s world-renowned beauty. The development, reported in the scientific journal Limnology Tomorrow, drew surprise and delight from California water interests who have long regarded the bi-state alpine lake as politically off limits for new water supply. The pier-reviewed study reveals breakthroughs in acrylic or Plexiglas technology and hydrologic engineering that would enable construction of a transparent cap covering all 193 square miles of the lake and suspended about 120 feet below its surface. The cap provides 99 percent light transmission, making the sub-surface reservoir “virtually invisible,” said A. W. Von Schmidt, a civil engineer who led the three-year study by the Reber Foundation of San Francisco. The study team set the depth of the Plexiglas floor at 120 feet in accordance with the lake’s restoration plan. 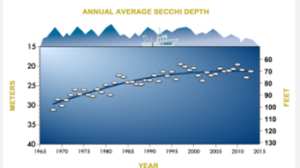 Lake clarity is routinely measured by lowering a white “Secchi disk” the size of a dinner plate into the lake until it is no longer visible. Water would be drawn from a valve in the Plexiglas top at the lake’s dam in Tahoe City, which releases water to the Truckee River. A diversion dam would be built 3.75 miles downstream of the Lake Tahoe Dam. At this point a six-mile canal would branch off from the Truckee flowing into Squaw Valley. A five-mile tunnel beginning at the head of Big Rock Candy Mountain Creek would carry the water through the mountains to a tributary of the North Fork American River near Soda Springs. The water would then flow along the granite bed of the American River for 12 miles to a 40-mile canal that would link to a large reservoir near Auburn. From the reservoir, a pipe would carry the water to Folsom Reservoir, a key source of drinking water for many Sacramento area communities including Fair Oaks, Roseville, Citrus Heights and Folsom. Meanwhile the U.S. Bureau of Reclamation thinks that the idea of siphoning Lake Tahoe is hardly original. The lake is already a reservoir that operates for irrigation storage and municipal water in the Reno-Sparks area. The Tahoe City dam, originally built in 1870, raises the natural lake by several feet. It should be emphasized that The project, dubbed “Tahoe to Tap”, would triple California’s surface storage and generate hundreds of construction jobs, said Calvin Hobbes, a modeler at the UC Davis Center for Watershed Sciences who examined the plan. 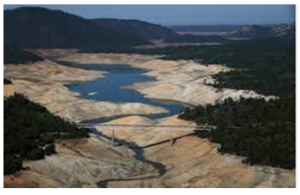 This project arises because California and Nevada have been hit the hardest of any states in this year’s drought. Nearly 40% of the state of Nevada is in extreme drought this summer and California has the nation’s worst drought with 76% of the state experiencing extreme drought. The shortage of potable water has been so severe that California is now investing in long-term solutions, such as pumps water systems and this kind of project that we have mentioned previously. For this problem with the water the Governor Sandoval tried to reduce concerns about lowered water levels in Lake Tahoe. It is sheer hubris to think that in our erratic western climate, which swings between desiccating drought and heavy wet winters, Lake Tahoe can be kept in perfect equilibrium to satisfy all users. History has proven otherwise. Long-term droughts have dropped the lake well below the natural rim, rendering the reservoir useless for extended periods of time, while powerful storms and wet mantle floods (rain-on-snow) have forced the release of Tahoe water into an already swollen Truckee River and aggravated existing flood conditions. Indicative of our region’s climatic volatility, 20 major floods have occurred on the Truckee River in the last 150 years. High water levels and flood mitigation are only one side of the coin. Extensive tree ring analysis indicates that severe droughts lasting centuries or more have seared the western landscape in the not-so-distant past. Ancient tree stumps underwater in Lake Tahoe are convincing evidence of climate change and a long-term dry period that occurred between 4,000 to 6,000 years ago. The submerged trees were first discovered in 1934 by Samuel Harding, a University of California, Berkeley scientist, who noticed the drowned stumps after a prolonged drought had lowered Tahoe’s water level 14 inches below the rim. In recent decades submerged trees have been located off various shores of the lake, the oldest dating to 6,300 years. Scientists theorize that a mega-drought lowered Tahoe’s water level long enough for a forest to sprout and grow for decades before a changing climate pattern increased annual precipitation in the region and raised the lake. More recently during severe drought in the 1920s and 1930s, Lake Tahoe fell below its rim eight years in a row and the Truckee River dried up. To satisfy downstream water demand, large pumps were installed near the Tahoe Dam; over several years more than 117,000 acre feet of water was sucked from the lake. Newspapers reported that Tahoe residents were intent on sabotaging the pumps. Armed confrontations were barely averted between Tahoe residents and hired hands doing the bidding of farmers in Fallon. The most important here is Water Management, the snow surveys are very helpful in forecasting seasonal replenishment into Lake Tahoe, but determining how much of the lake’s water will be available when it’s needed is like hitting a moving target. The art of managing Tahoe’s storage elevation is based primarily on measuring the results of winter storm activity, but on average, nearly 75% of the water stored in the lake is lost to evaporation. Summertime air temperatures along with wind conditions significantly affect the lake’s water level, usually stealing about three feet of water each year. A strong wind can evaporate more than 1 billion gallons of water from Lake Tahoe in a day. In other words, much more water dissipates into thin air than is ever released into the Truckee River. In 1913, a modern concrete buttress dam designed with 17 gates was completed, and in 1915 a federal district court awarded the U.S. government control of the structure. 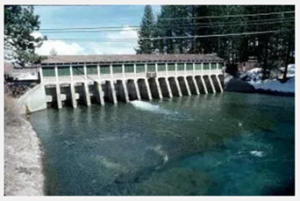 To acquire the recently completed dam from the Truckee River General Electric Co., the court ruling guaranteed the power company a specified flow of water throughout the year while ignoring other existing water rights. It was a recipe for disaster. The new dam further boosted the maximum elevation of Lake Tahoe, but the government wanted indemnity from any problems caused by the higher water levels. 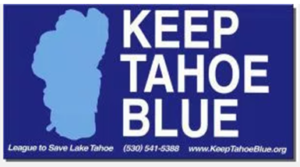 The Bureau of Reclamation requested that Tahoe property owners sign quitclaims releasing the government from any liability associated with the potential impact of using Lake Tahoe as a reservoir. The local community was outraged and a mass meeting was held at Lake Tahoe by incensed residents and business owners, environmental groups, and various state and local governmental agencies. Lake Tahoe is a national treasure of immense ecological significance. Sitting at 6,230 feet above sea level, the ‘Lake of the Sky’ is nestled high in the Sierra Nevada and straddles the California-Nevada border. The Lake’s clarity is world renown. Water is indeed the most precious natural resource in the arid West, and from that perspective it should come as no surprise that water rights issues on Lake Tahoe and the Truckee River have been at the center of negotiation and controversy since pioneers first settled the region.